The image at right is Hubble's close-up view of the myriad stars near the galaxy's core, the bright whitish region at far right. An image of the entire galaxy, taken by the European Southern Observatory's Wide Field Imager on the ESO/MPG 2.2-meter telescope at La Silla, Chile, is shown at left. The white box outlines Hubble's view. 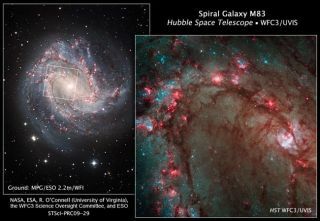 The Hubble Space Telescope's powerful new camera has takenthe most detailed image yet of star birth in the nearby spiral galaxy M83. Nicknamed the SouthernPinwheel, M83 is undergoing more rapid star formation than our own MilkyWay galaxy, especially in its nucleus. In this galaxy, the sharp eye of the Hubble's Wide FieldCamera 3 (WFC3) ? newly installed this summer during the telescope's fourth andfinal servicing mission ? has captured hundreds of young star clusters, ancientswarms of globular star clusters, and hundreds of thousands of individualstars, mostly blue supergiants and red supergiants. WFC3?s broad wavelength range, from ultraviolet tonear-infrared, reveals stars at different stages of evolution, allowingastronomers to dissect the galaxy?s star-formation history. The new image reveals in unprecedented detail the current rapidrate of star birth in this spiral galaxy. The newest generations of stars areforming largely in clusters on the edges of the dark dust lanes, the backboneof the spiral arms. These fledgling stars, only a few million years old, arebursting out of their dusty cocoons and producing bubbles of reddish glowinghydrogen gas. Gradually, the young stars? fierce winds (streams of chargedparticles) blow away the gas, revealing bright blue star clusters. These starsare about 1 million to 10 million years old. The older populations of stars arenot as blue. A bar of stars, gas, and dust slicing across the core of thegalaxy may be instigating most of the star birth in the galaxy?s core. The barfunnels material to the galaxy?s center, where the most active star formationis taking place. The brightest star clusters reside along an arc near the core. The remains of about 60 supernovablasts, the deaths of massive stars, can be seen in the image, five timesmore than known previously in this region. M83 is located 15 million light-years away in the SouthernHemisphere constellation Hydra.